SEPTEMBER 2018 – PORTLAND – The 70th National Session of the Mayors’ Institute on City Design (MICD) was held in Portland, OR from September 19-21, 2018. 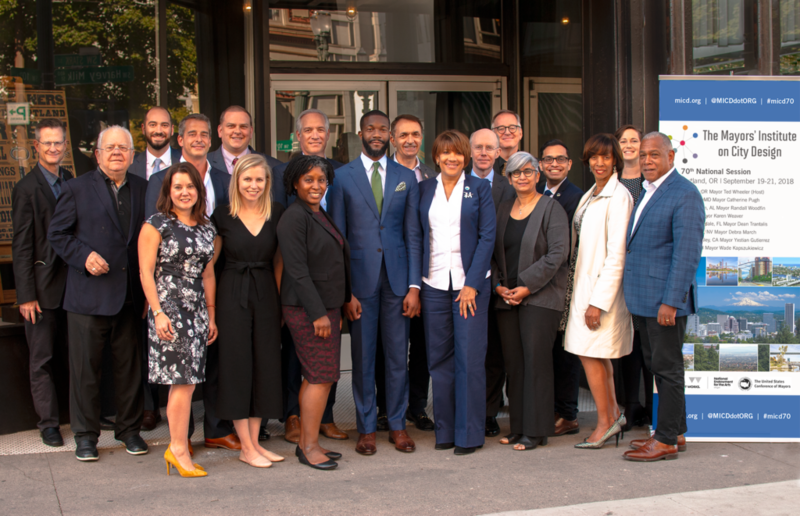 Hosted by Mayor Ted Wheeler, the event was attended by Baltimore, MD Mayor Catherine Pugh; Birmingham, AL Mayor Randall Woodfin; Flint, MI Mayor Karen Weaver; Fort Lauderdale, FL Mayor Dean Trantalis; Moreno Valley, CA Mayor Yxstian Gutierrez; and Toledo, OH Mayor Wade Kapszukiewicz. Experts in architecture, landscape architecture, urban planning, economic development, transportation, real estate development, and urban design joined the mayors in the two-and-a-half-day discussions and offered pragmatic advice on how the mayors could approach the design and development challenges facing each of their cities. The 70th National Session began with a walking tour of Portland led by First Stop Portland and ZGF Architects. The tour showcased the public investments that catalyzed private development in the Pearl District, including the Portland Streetcar. Later that evening, the opening reception and dinner took place at Plaza del Toro. Mayor Wheeler welcomed participants to Portland after opening remarks from MICD Executive Director Trinity Simons and U.S. Conference of Mayors CEO & Executive Director Tom Cochran. Mayor Kapszukiewicz initiated the discussions the following morning with a presentation on Toledo’s “Nautical Mile” project, which looks to reimagine the Maumee Riverfront in the vicinity of downtown. Following several catalyst projects on the west side of the river, a range of partners are coming together to develop the mostly-vacant east side. The Resource Team shared examples of comparable riverfront projects and other ways cities have attracted private investment through public realm improvements. Baltimore Mayor Pugh followed, eager to hear the team’s thoughts on the future of the area around Pimlico Race Course. Mayor Pugh sought ideas on transforming this venue, used just a few times a year during the Preakness Stakes, into a vibrant anchor for a struggling area. The Resource Team offered ideas for better integrating the site into the surrounding neighborhood and making targeted investments to kick-start momentum in the area. Next, Mayor Gutierrez introduced Moreno Valley’s Town Center project. To provide a central gathering place for residents in this suburban community, the mayor seeks to develop a vacant area into a vibrant hub of civic activity. The Resource Team suggested ways to use street design, placemaking, and a blend of density to create a unique and beloved community center. Mayor Woodfin closed out the first day with a presentation on Birmingham’s Ensley neighborhood. With disinvestment dating back to the loss of steel industry jobs in the 1970s, the mayor has a crucial opportunity to reinvest in this historic area. The Resource Team suggested steps to catalyze activity on the historic 19thStreet corridor and beyond. To kick off the second day, Mayor Weaver presented an overview of opportunities to rebrand Flint’s gateways and better communicate the exciting renaissance taking place in the city. The project sparked a lively discussion about using street design, wayfinding, and architectural cues to show off Flint’s unique character. Mayor Trantalis concluded the session with a discussion of the area around a new high-speed rail station, which presents the opportunity to redevelop Fort Lauderdale’s City Hall and other publicly-owned properties nearby. A number of factors complicate this project, so the Resource Team recommended strategies for improving walkability and creating a world-class public realm. Joining the mayors at this National Session was a distinguished group of Resource Team members: Monica Chadha, Founder of Civic Projects in Chicago, IL; Victor Dover, Founding Principal of Dover, Kohl & Partners in Coral Gables, FL; Chris Garvin, Founder of Biome Impact LLC, New York, NY; Paul Morris, CEO of MCP Foundation in Atlanta, GA; Dr. Allan Shearer, Assistant Professor at the University of Texas at Austin; Mitchell Silver, Commissioner of the New York City Department of Parks & Recreation; Rhiannon Sinclair, Urban Planner and Project Manager at Agency Landscape + Planning in Cambridge, MA; and Judith Taylor, Partner at HR&A Advisors in Los Angeles, CA.